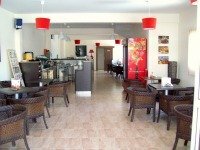 Rental property Cyprus, has recently become very popular. Especially, long term property rentals in Southern Cyprus. Recently many visitors to my website are looking for, long term rentals. I think the main reason is that many have decided to try a temporary move before committing to buying property in Cyprus. The Recession has paid an important role in this change. Others waiting for their new property to be completed are also looking for rental property Cyprus. Some just don't want to wait, their just very eager to move to the island of health and sunshine. It maybe 6 months before or even longer. They may, quite rightly, want to be around to see their propery being built from the ground up. That way they can make sure everything is being done to their specification. I must admit, watching your new home being build is an exciting and new adventure for most. I remember watching our first property being built, it was a truly exciting experience. Here's a photo of our first home in Cyprus. Oops!! I could have got carried away there! People usually look for a rental property close to where the Cyprus property developer is completing their new home. It's such a good idea to be close by to monitor progress of the developement every day. Some people just can't hold off moving to Cyprus. So renting is the most economical solution. 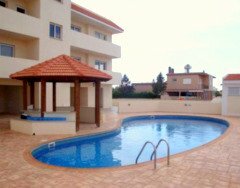 If your looking to buy property in Cyprus, renting gives you time to visit different areas, towns, villages, properties, developments, resales etc. Another advantage is that you have an opportunity to find out whether living in Cyprus is right for YOU! If it's not... you don't have to worry about selling a property. If you decide Cyprus is right for you, finding your dream property to buy in Cyprus will be a snip. We all possess that gift of walking into a property and within a few minutes, we know it's the right one for us. So it makes a lot of sense to take your time before making a big committment. Currently, because of the global economic crisis, the price of property in Cyprus is now realistically priced again. Renting short term is fairly popular too. It may be that you want to look around for property or just take a break from your usual routine, but don't want the expense of staying in a hotel for a month or two. Renting for holidays has also become very popular with families. You have more flexibility. You don't need to dip into your spending money for the kids every 5 minutres for drinks or snacks. It is also much more relaxing, fun and a lot quieter than some hotels. If you all ready have a good idea of what your looking for, I can help you find it. I know many reputable agents in Southern Cyprus. Just click the blue link in the yellow box, to go to the contact form at the bottom of this page. Just be sure to tell me; the type of property, eg; villa, bungalow, apartment, townhouse, number of bedrooms. Which area, Nicosia, Larnaca, Kapparis, Paralimni, Protaras, Ayia Napa etc. and your budget for rental. I will do my best to help you find the right property for rent in Cyprus to suit you. I Can Help You just tell me what your looking for. If you can't find what your looking for, just type your search term in this convenient Search Box, just iike you would at google. Pretty cool! I hope you'll come back to visit again!